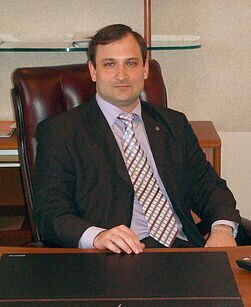 Attorney-at-Law Sergey N. Vinokurov works a law firm in Moscow. Information about an attorney entered in the register of the Bar chamber of Moscow region, where Sergei Vinokurov successfully passed the test of confirmation of qualification requirements of an attorney-at-law (advocate). Being an attorney for a long period of time, undertook litigation in various areas of law. Currently, an attorney practicing civil law in the preparation of various contracts and transactions, bankruptcy and private international law. In this regard, the lawyer represents clients in arbitration courts and courts in civil disputes. 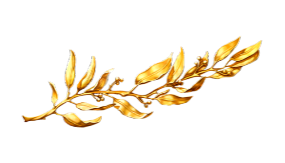 The The lawyer has qualified as a lawyer, graduating from the law faculty with honors. Further, the defense has continued her studies at the Russian Academy of Justice (currently Russian State University of Justice) in a master's program "civil and arbitration process", specialization in "Judicial work on еру resolution of economic disputes", which also graduated with honors, receiving the degree of master of law. Currently, as a graduate student of the law Institute of The Peoples' Friendship University of Russia, a lawyer conducting research in the field of civil law, business law, family law and private international law (12.00.03 cipher). The activity of the lawyer Sergei Vinokurov started as legal counsel in one of the leading law firms specializing in the conduct of civil Affairs in the field of entrepreneurship and the primary duty of a lawyer in the period was the provision of legal services to businessmen in the field of arbitration cases and participation as a representative in arbitration courts of various instances. In the course of working as a legal counsel, lawyer Sergei Vinokurov, he gained extensive experience in the field of challenging debt, disputes regarding corporate real estate, corporate disputes, and more. Further, the defense continued its work as a corporate lawyer for companies associated with the creation of various software products for government agencies (MVD, FSB, Ministry of defense, etc.). 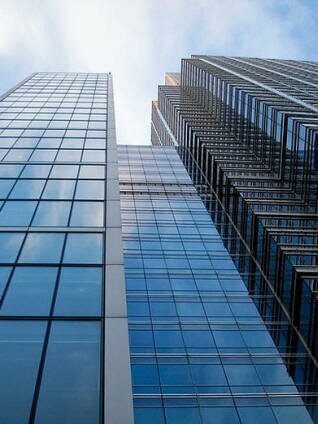 In the course of its business as a corporate lawyer, a lawyer drawn up a contract for exclusive rights, contested claims concerning the protection of results of intellectual activities, prepared license agreements and participated in legal support for government contracts. After Sergei Vinokurov has successfully taken the bar exam for obtaining the status of an attorney-at-law, he established a law firm. As a lawyer, he began to carry out tracking of various bargains, preparation of contracts, legal support of procedure of bankruptcy. To represent the interests of clients in arbitration courts and courts of general jurisdiction in various civil disputes. Assistance to citizens and businesses in the field of private international law. Legal practice of a lawyer includes various categories of civil cases in all court instances of arbitration courts and courts of General jurisdiction. The lawyer has successful experience in various cases, including those related to private international law in cases complicated by "foreign element". The lawyer speaks English at an advanced level. 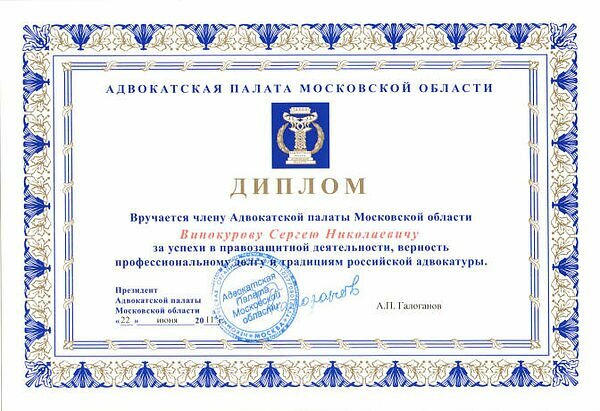 This diploma which the attorney Sergei Vinokurov was awarded the Bar Association of the Moscow Region for success in advocacy, loyalty professional duty and tradition of advocacy in Russia.